We’ve already predicted that we’ll be seeing tons of “ugly” shoes next month when fashion month kicks off. From furry footwear that resembles Muppets to cleft-toe snakeskin boots, the street style set will be shuffling from show to show in style(?). And with the news that Jeremy Scott, purveyor of kitschy graphics and pop culture references, has teamed with UGG to produce eight styles of the classic boot for fall, suddenly there’s another contender in the “would you wear these?” category. Scott’s eight styles are pretty much what you’d expect from the OTT designer. Bold flames, colorful crystals and beads arranged in a floral pattern…you get the idea. 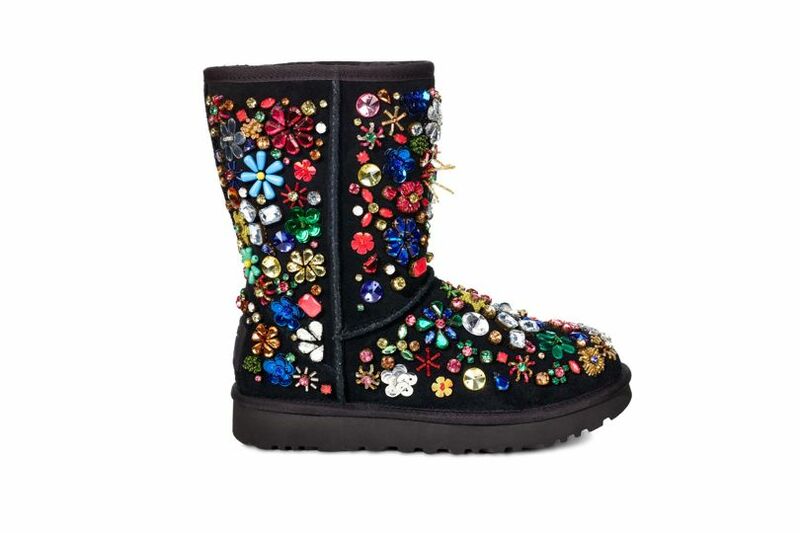 The collab actually includes boots for the whole family, a first for UGG. (The brand previously partnered with Jimmy Choo on a women’s shoe and will team with 3.1 Phillip Lim this October on something for men.) Scott’s line drops September 13 (just in time for the start of London Fashion Week) and will cost $90 to $1,195 at select retailers around the world. Or, you can get your kicks at five North American retailers: Intermix, Serenella, Just One Eye, Chuckies and David Lawrence. In case you’re not feeling Scott’s attention-grabbing designs, you’ll be happy to know that UGG is hoping to team up with other designers down the road. “We are talking to a range of designers at the moment, either born in California or who have interesting stories to tell about what UGG has meant to them,” said O’Donnell. Even though they technically may not fit into that narrow spectrum, we’re secretly hoping the company teams up with Rachel Comey or Virgil Abloh on some avant-garde (yet still comfy) UGGs.